One by one they all heard their names called. Some answered that call in a wheelchair. Others carrying a cane. 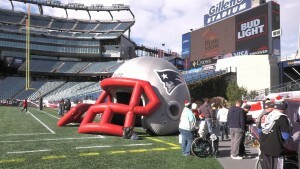 And many of the rest ran through the inflatable Patriot helmet onto the field at Gillette Stadium the first Saturday in November, greeted with a sustained round of applause. Close to 30 military veterans gathered from Massachusetts and Rhode Island. 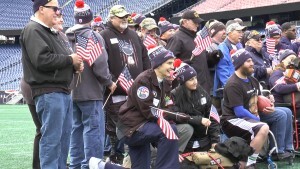 They came from all walks of life and eras of service for a football skills day — a joint effort by CVS Health and the New England Patriots in honor of Veterans Day. Before the day was out they’d run drills with former Patriots players and get autographs from them; then have lunch adjacent to the field, with a chance to chat and share war stories — in some cases literally. “Thank you to you and your families for the absolutely incredible sacrifices you’ve made and you continue to make every single day, in service to our great nation,’’ David Casey told the group at the beginning of the day. Casey, a former Marine, is now the chief diversity officer for CVS Health. Casey was right in the middle of it all, watching as the veterans broke off into three separate groups. 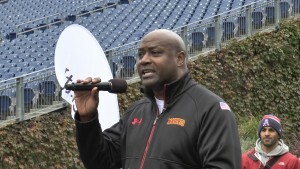 Former Patriot linebacker Vernon Crawford ran a clinic on blocking. 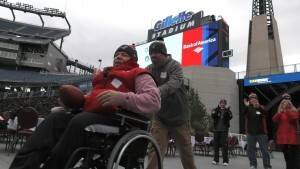 Former fullback and special teams player Harold Shaw worked on passing with those in wheelchairs, while former fullback Patrick Pass showed off his arm for those running routes up the field. You could call them Pass patterns. And being out on the field with other vets, he said, was the highlight of the day — that and catching a few throws from Patrick Pass. So what do the veterans want others to remember about Veterans Day? If you want to see the video version of this story go to RhodeIslandSpotlight.org. If you know of a person or organization who you think deserves the Spotlight, send an email to Jim@RhodeIslandSpotlight.org.